California parking lot accidents are something we should all be thinking about as we approach the holidays especially if we live in busy urban areas like Los Angeles, Orange County, San Diego or the Inland Empire. The holidays brings out shoppers to all types of retail establishments ranging from grocery stores, to strip malls to full scale indoor and outdoor shopping malls. Parking can be a nightmare and the volume of motor vehicles and pedestrians increases dramatically. With all of this comes the potential for vehicular accidents. Many of these crashes are low speed impacts between two cars but, sometimes higher velocity collisions can occur between cars and auto v. pedestrian mishaps are also common. Any of these types of scenarios can cause injury or even death to adults and, especially, to children. 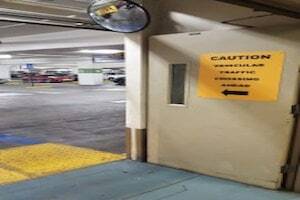 As an attorney who has represented numerous persons injured or killed in and around parking lots, I thought I would analyze the legal liability aspect of such mishaps. Back Out Mishaps: Car backing out of parking spaces can collide with other vehicles and can run into pedestrians including running over children. Sudden Turns: In a rush to get that last parking space, people often take unsafe measures like making sudden turns, turning down the wrong way in a parking aisle or other dangerous driving practices. Excessive Speed Incidents: Again, “hustle and bustle” to get in, park and exit a structure or lot can lead to accidents. Speed bumps and other safety measures may help but, don’t always slow vehicles down enough to avoid tragic incidents like smash ups with other cars or striking people walking through the area. Sometimes excessive speed can even lead to a car jumping the curb or stop and going up onto a sidewalk or other pathway where people are on foot. Rear End Collisions: Getting rear ended can occur when a vehicle makes a sudden stop or abrupt movement and vehicles behind them are too close, going too fast or not paying attention. Entering or Exiting Parking Lots: Many crashes occur when automobiles or even larger vehicles like commercial delivery trucks are pulling into or pulling out of a parking lot. Many parking entrances or exits abut sidewalks or busy surface streets. Without the proper amount of caution, a vehicle can hit another car, a pedestrian, a bicyclist or motorcycle. 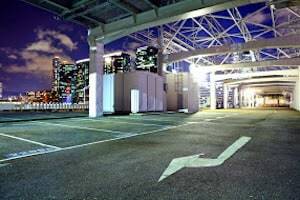 What Does California Law say aBout Legal Liability for Vehicle Crashes in Parking Areas? California Vehicle Code 22352: Sets the prima facie speed limit at 15 m.p.h. in any alleyway. Potential Civil Damages Claims Against Property Owner: As I have pointed out in other blog posts and pages (click here) a property owner is liable for injuries due to dangerous conditions on their premises for which they knew or should have known about based upon the foreseeability of an accident occurring. This would include failing to maintain the parking lot or structure in a safe manner, failing to provide proper staffing of parking lot attendants, and poor design of parking areas that could cause unreasonable risk of harm to persons in or near the area. For example in Robison v. Six Flags Theme Park 64 Cal.App.4th 1294, an amusement park was held liable for placing a picnic area directly adjacent to a parking lot when a vehicle exiting the lot lost control and crashed into a group of people sitting at one of the tables. Throughout California, there are hundreds of thousands of lots and multi-level parking structures in and around retail and other commercial spaces. Los Angeles alone is estimated to have parking structures in the hundreds with the capacity for thousands of vehicles. It only takes one misjudgment by a driver or dangerous condition on or near the property to cause serious injury or wrongful death. A quality personal injury attorney familiar with these claims can conduct the proper investigation including hiring a forensic engineer to measure and analyze things like lighting, design layout, line of sight and visibility, signage issues and other factors that may have caused or contributed to the incident. Likewise, an accident lawyer familiar with the rules of the road as they relate to offstreet private parking is able to provide an analysis of the potential fault for motor vehicle collisions with other cars, pedestrians, bikes and motorcycles. Having this expert legal advice and consultation is essential to full and complete recovery of compensation for medical and other expenses.